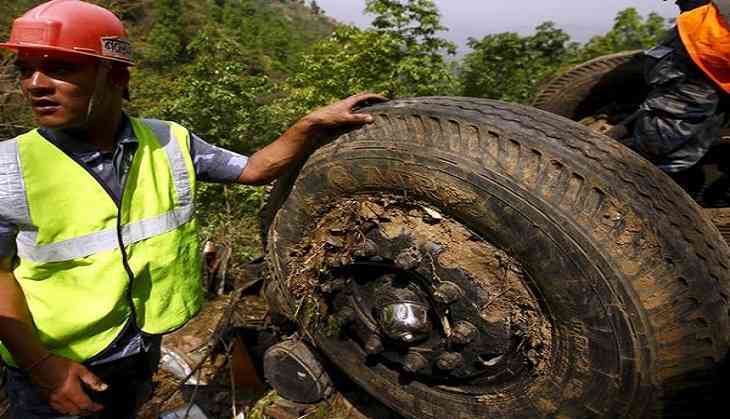 Four people died and seven others were injured after a jeep they were travelling in skidded off the road and fell some 100 metres down due to brake failure last night at Tarkenibasi in Nepal's Fikkal Rural Municipality-4 of Sindhuli district. The deceased have been identified as Amar Bahaur Darlami, 40, Ram Prasad Baral, 40, Dil Bahadur, 59, and Nara Bahadur Balampakhi, 60, of Fikkal Rural Municipality-4, the Kathmndu Post reported. The injured are receiving treatment at Khurkot Hospital in Golenjor Rural Municipality in the district. Police said that one person who was critically injured in the accident is undergoing treatment at B & B Hospital in Satdobato, Lalitpur. According to the report, the local of Fikkal Rural Municipality-4 were returning home after receiving the quake grant when the tragedy took place. Police have arrested jeep driver Yagya Bahadur Rana Magar for investigation.